Potatoes. Spuds. Tubers. No matter how you slice ’em—or mash, dice, or grate ’em—that bit of prep is worth the delicious results! And when you love spuds, these dishes really deliver. What better way to show your loved ones you care than serving up delicious and nutritious fare? Since we tend to serve the best eats during the holidays, IVI presents two tried-and-true recipes for your holiday season, or for year ’round enjoyment. At IVI, our aim is to help growers protect their potato harvest in storage, before they are delivered to market. The tastiest spuds have enjoyed a fruitful (or vegetable-ful) time in the ground, and are then well tended to in storage. Controlling temperature, humidity, and air flow, among other factors, are key for the best results out of storage. Store in a cool, dark place with plenty of air circulation—not in the refrigerator, and not in the freezer. To help your potatoes last longer, keep them in an open bowl, paper bag or another container with holes for ventilation. This helps prevent moisture accumulation, which leads to spoiling. Potatoes last longer if they remain dry during storage and are not washed until they’re ready to be used. Keep away from other produce, especially bananas, tomatoes and onions, since the ethylene gas they release can make the potatoes sprout more quickly. Storing your potatoes correctly helps preserve the vitamin C content. The nutrient-rich potato is also high in potassium, is fat- and cholesterol-free, and spuds are good for your brain. First up is an amazing potato roll recipe courtesy of the Mitchell family, from the potato-rich area of Southern Idaho. Soft, fluffy, and lightly flavored, these rolls make an excellent accompaniment to almost any main dish. Dissolve yeast in warm water. Stir in potatoes, sugar, shortening or butter, eggs, salt and 3 cups of the flour. Beat until smooth in a stand mixer. Add enough of the remaining flour to make dough easy to handle. Turn dough onto lightly floured surface. Knead until smooth and elastic, about 5 minutes. Place in a greased bowl, turn greased side up (or grease both sides). Cover bowl tightly, refrigerate 8 hours. Beat back down and divide into two. Roll out in a 14 – 16” circle. Using a knife or pizza cutter cut into 12 “pizza slices”. Starting on the outside edge, roll each piece into the center to form the crescent rolls. Place on a cookie sheet with small tail on the bottom and curve edges in slightly. Cover with plastic wrap and let rise again. Heat oven to 375°. Cook for 9 minutes. It’s best to make these a day ahead to let the flavors develop. You can keep dough in the refrigerator for up to 5 days. Eat these rolls with butter and jam with your holiday feasts, or make larger rolls, which are perfect to make into leftover turkey sandwiches. 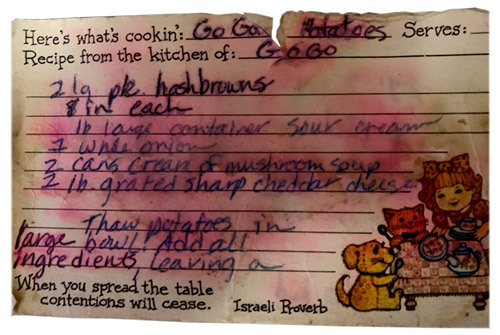 Go Go’s Potatoes is a family recipe, regularly baked by Go Go, who enjoyed showering her kids and grandkids with delicious food, with lots of love poured in. A life-long resident of the great state of Washington, Faye/aka Go Go knew easy can be good—and this dish is proof. Like many great side dishes that evolved during the early years of her motherhood, a can of mushroom soup came into play. In this case, two cans. Enjoy this yummy side dish for the generations. It may just become your own family’s go-to side dish. Thaw hashbrowns in large bowl. Add all ingredients into a large Pyrex, leaving a little cheese out, and mix well. Bake at 350° for approximately 1 hour. Sprinkle extra cheese over towards the end of the baking time. Do not place a lid on while baking. Use less cheese if desired. You should have a nice crispy skin and a fluffy, soft interior ready for your butter and chives or any other topping combination you can dream up. Have a delicious potato recipe? We’re always looking for another great potato dish to add to the rotation. Send us your recipe and we may feature it in an upcoming post for others to try this winter season. Please include your recipe and what it is that makes it special. Have a great picture of your dish? Include it here. The technology and service leader in industrial ventilation for vegetable storage.